I’d never given much thought to the difference between a concentration camp and an extermination camp until I visited Terezín, about 60km outside Prague, last weekend. It’s a fortress town, surrounded by walls, consisting of large barracks buildings dating back to the late eighteenth century. If ever a town was built to be a prison, this was it. Easy to guard, close to the railway, and it already had a police prison in the Small Fortress. The grand plan was to isolate all Jews from the general population, concentrate them in a few places, and then send them eastwards to be terminated. Terezín fit the bill beautifully. The first lot of 324 Jews arrived from Prague on 24 November 1941. Their job was to prepare the town for the onslaught that was to follow. 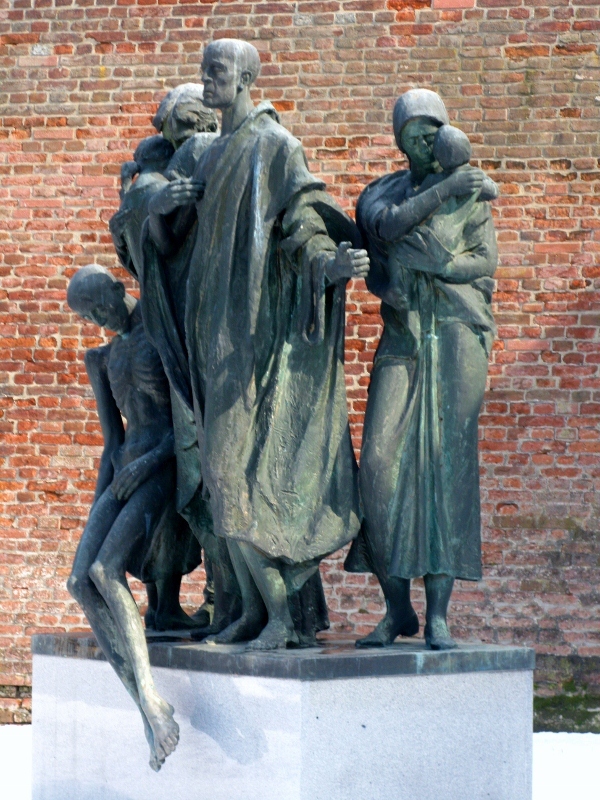 So many Jews arrived that on 16 February 1942, the original inhabitants were given till 30 June to leave. 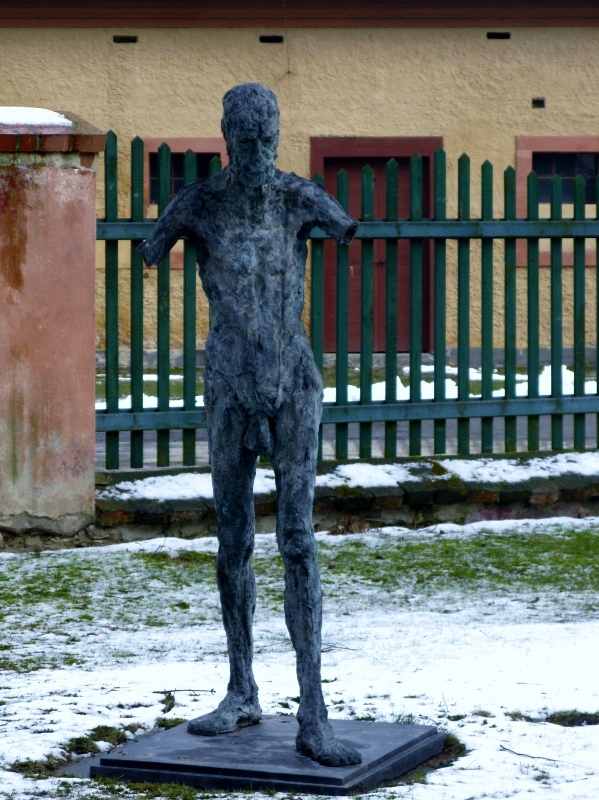 In the years that followed, over 150 000 Jews would pass through the town of Terezín. Only 3600 would survive to bear witness to what went on there. There’s a fascinating article that tells of how many Jews voluntarily moved there, thinking the town was a gift from Hitler himself. During the Second World War, Heinrich Himmler, head of the Nazi SS, suggested this magnificent site for a city and spa to be called Theresienstadt and to be owned and governed by Jews. It would be protected exclusively by Czech police, with no SS troops nearby. This utopia would even have its own currency depicting Moses carrying the Ten Commandments. The Czech Jewish community, eager to inhabit their new city, worked beside the Germans to construct and prepare Theresienstadt. German chancellor, Adolf Hitler, declared this glorious region to be a gift to the Jews in recognition of their enormous contributions to Eastern European societies and in preparation for the life awaiting them in Palestine. Yet the horror of what was happening soon became clear. At the Small Fortress, I watched a short propaganda movie that showed how easy it is to believe what we want to believe. The figures it gives are horrendous. 19 000 + shipped out, 3 survived. 1000 shipped, 1 survived. The Small Fortress is quite the spectacle. Originally built at the end of the eighteenth century, it reminded me a lot of the fort at Komárom, except for the purpose to which it was put. From day one of its existence it was a prison. 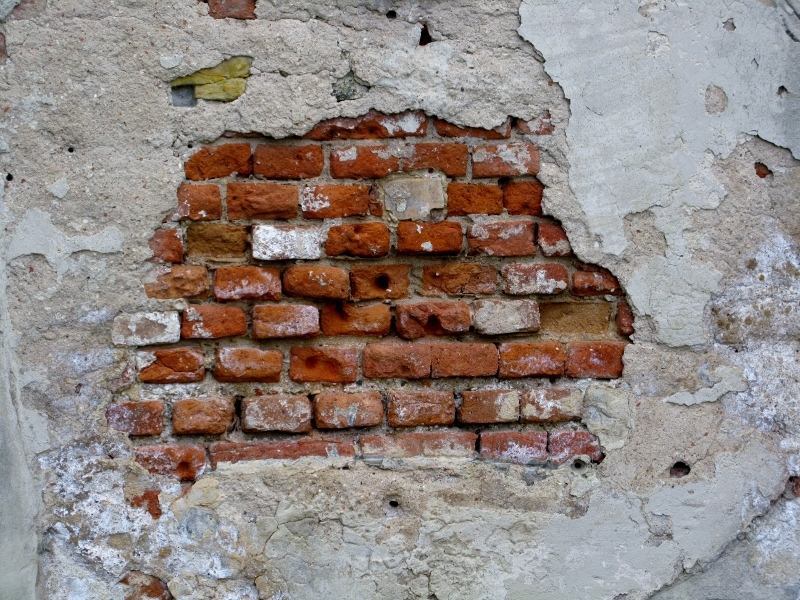 Franz Ferdinand’s assassin spent time inside its walls. As the Nazi’s kicked into gear, prison space was at a premium. 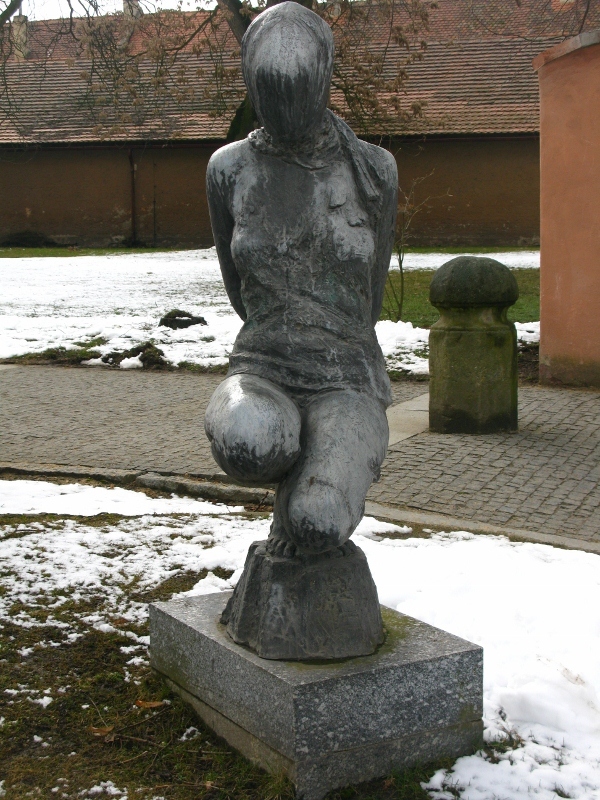 The Gestapo moved in, in 1940, and by the time the war ended, some 32 000 prisoners would have graced it with their presence, including 5000 women. For most, it was a temporary stop, but for some 2600, it was the end. Disease, living conditions and torture put paid to any hope they might have had of surviving. Well-mapped for tourists, everything is spelled out in stark detail. The numbered exhibitions clearly state, in concise English, what went on. The execution grounds, the bullet-ridden walls, the gallows from which three people were hanged – all testify to man’s inhumanity to man. I have the good fortune to live in a spacious apartment. No matter how hard I try, I cannot get my head around what it must have been like to share the same space with so many others. 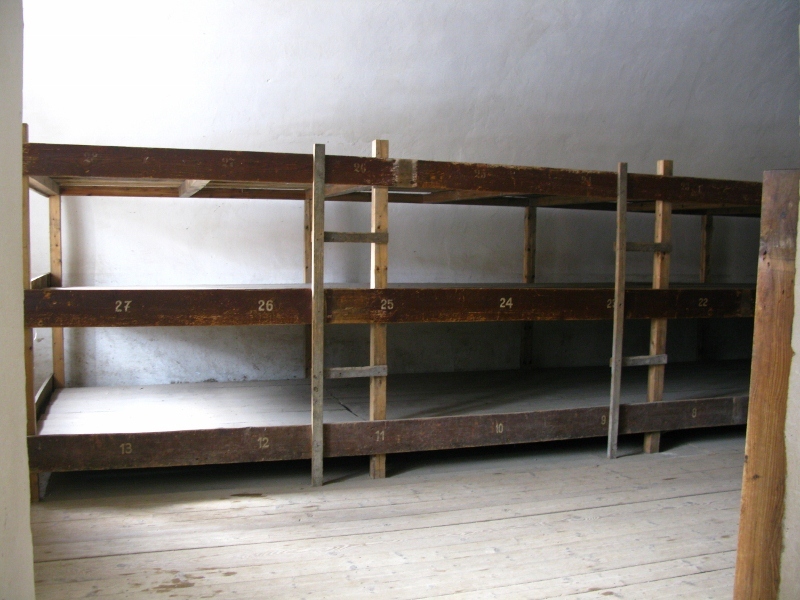 Numbers were etched into wooden bunk beds where people considered themselves fortunate to live, because to be alive was what mattered. 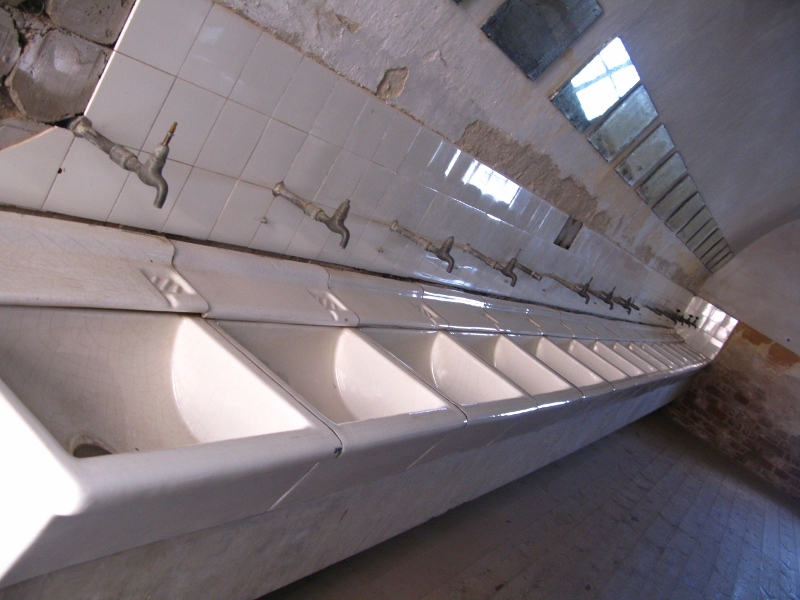 Rows of hand basins in the ‘model barbershop’ were there to show how much the authorities valued hygiene. After a while, I found myself thinking back to Auschwitz and to Dachau and to the remnants of the horrors I’d seen there. 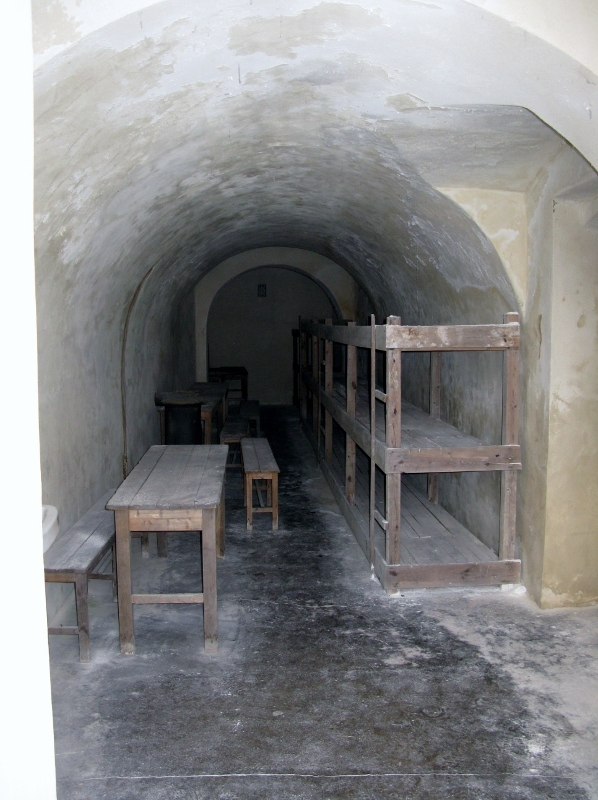 In comparison, Terezín was small potatoes. 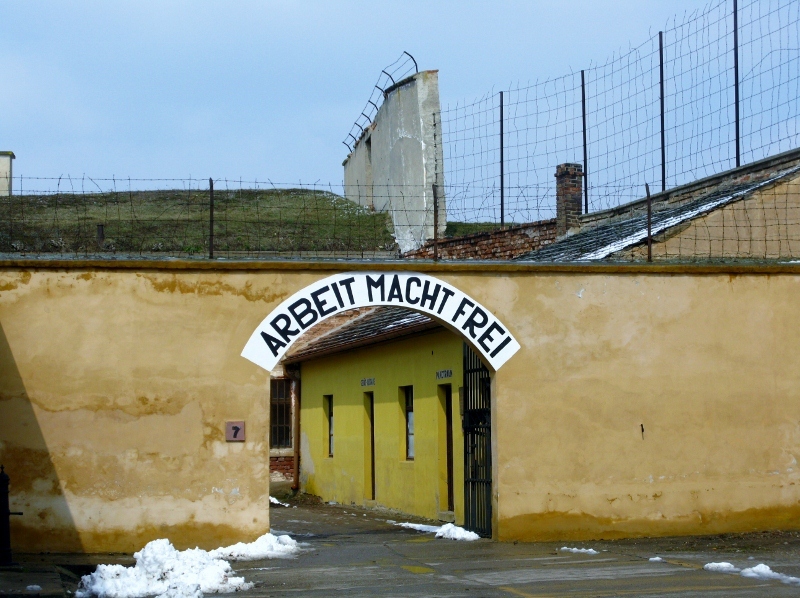 It wasn’t even a labour camp as such – it was, in effect, a Gestapo prison – a holding ground – which makes the inscription Arbeit macht frei a little unusual. STOP RIGHT THERE! Has it really come to this? Have I become so inured to atrocities that I find myself weighing the numbers and from my privileged vantage point coming out with thoughts like ‘small potatoes’? Sweet Mother of Divine Jesus, deliver me, and please tell me that it is just my way of coping with what I was seeing and hearing and reading and imagining. I tell you, there’s nothing quite like a cold hard lump of steel to shake my reality. This statue, and others in the grounds, said far more than numbers ever could. And while numbers might have that initial grenade-type effect, it’s images like these that really hit home. May we be damned for eternity if we EVER allow something like this to happen again. This week, I am grateful for those monuments to the past that serve as constant reminders of the fragility of human life, our propensity to abuse our power, and our reluctance to stand up and speak out in the face of injustice. Let them continue to remind us of our responsibilities as human beings. Will be blogging about that book, too, later this week Ginger. Truly compelling.